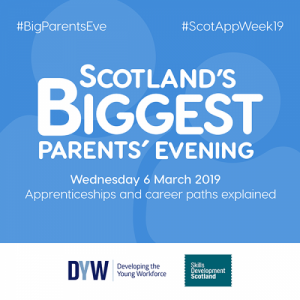 Scotland’s Biggest Parents’ Evening is part of Scottish Apprenticeship Week 2019 – the annual campaign highlighting the value apprenticeships and work-based learning brings to individuals, employers and the economy. The aim of this event is to help parents & carers understand why they should encourage more young people in choosing an apprenticeship. It will provide an understanding of the apprenticeship family while getting rid of the myths and misconceptions. Join us at the Centre for Enterprise, Dundee and Angus College, Arbroath Campus, Arbroath on Wednesday 6 March to find out more from local companies and apprentices about why it works for them. Skills Development Scotland, Dundee and Angus College and Developing the Young Workforce will also be there to explain the what and the why of apprenticeships. Can’t make it? Don’t worry you can tune into our youtube channel on 06/03/19 between 6 – 7.30pm for a live stream of the event or check it out the next day. Send in questions for our apprentices to contact@dywda.co.uk or message us on social media.